The following address was delivered by the Chairperson of Republican Network for Unity Carl Reilly, at his party’s annual conference in Newry on Saturday, 26th September. I would like to start by thanking you all for once again electing me as the National Chairman of Republican Network for Unity. Being the National Chairman of the party for the year 2016 is a matter of great personal pride for myself and I thank you for that honour. Can I thank the outgoing National Chairperson for the help, guidance and critique that he gave the party during his tenure as party chair and I hope to count on those skills in the coming year. Can we have a round of applause please for Gary McNally. Comrades, today we agreed party policy for the year ahead. You have mandated an incoming Ard Comhairle to steer this party into the 100th anniversary of the 1916 Easter Rising. I know from talking to them all, the privilege they take from that. We have shown in the discussions today that we are about educating and empowering ourselves, that we are prepared to tackle hard issues and not shy away from them. Those discussions today for me shows that we are prepared to lead when the time comes. But when is that time? Is it some airy fairy dream talk? Is it a mantra that makes us feel good about ourselves? I believe that we need to set goals and targets and benchmark them. We stood for election in Belfast last year for the first time. We did so with a group of people who for the most part had never even voted before let alone tried to get elected. We took much from that experience and i believe that we will be stronger next time around. In Derry City and Belfast at the next council elections we have a very real chance of a seat in both cities. I feel we could stand and take a seat in Dublin and Dundalk Councils also. For such a young party that would be great strides. It will only happen however with continued hard work, not hoping for it to happen. What is essential for party stability and to attain our goals is discipline and steadfastness. Today we sit with new faces which we are delighted to see as it shows our party is attractive to Republicans. We have lost faces also, I feel for different reasons. Some have just gave up, some hadn’t got the determination to see things through, some lost faith in our strategy and others thought they would go with whoever looks bigger in number or whoever was offering them better protection. However, some are not here because of interference from either directly or indirectly the influence of British and Irish security forces. Our enemies who come in different guises want to see us gone, left the stage. The British and Irish states vilify us in the media, they intern our party activists and harass us and our innocent families. Other ‘Republicans’ want us out of the way, they attempt to undermine and smear us to marginalise or embarrass us. Others attempt to criminalise us and infringe on our presence in communities. Why? Why, if we are so irrelevant do they all for different reasons do what they do? It’s because we are relevant! That doesn’t mean we are the finished product, we are far from that, but what we do have is sound policy, direction and more importantly, honesty. The message we send out today to all of them is; we are going nowhere! Next year will be significant for all of us and for those around us and the people of Ireland as a whole. We must leave our impression on events next year. I would ask you all to fully participate in next year’s events. I accept that it will be a heavy year of travel and political work, but if done right, what a year it will be. For the work required to make it a success it needs to be shared and we must share it. No small group of people or area of RNU in Ireland can do it alone. Ask yourselves this; what am I or RNU doing locally in my area for 2016? What are we doing locally to help the national 2016 project? If you find yourself saying not enough, then make it enough. Unity is a buzzword that for the past few years has been bandied about. We have offered the hand of friendship as have others, but what next? I feel that RNU giving up their time slot this Easter in Dundalk was a difficult decision, but one that will show how serious we are about unity. I feel that we should talk to like minded Republicans more in the year ahead. We need to talk more about what we support about each other and offer comradely critique of each other in private, not on forums or Facebook. Other groups, like us, have a responsibility to each other also. We should be able to engage with each other without worrying about who is looking to be seen to be the chairperson or public speaker or what groups looks like they are running things. We shouldn’t have to worry about undermine and absorb directives. We shouldn’t have to worry about meetings outside of meetings. We should be solely fixated on what we can do for each other, the Republican struggle and our communities. It is also worth noting that a very small number of former members of RNU have defected to other groups, to some we wish you well and hope that the new group gives you what you are hoping for. Our door will remain open to you should any of you wish to return. Others who have defected have did so because they were about to be exposed as agents or for engaging in criminality. These defections were not about politics or disillusionment with RNU, it was more about protection and cover. In time you will be held accountable for your actions no matter how long that takes. RNU and the wider Republican movement are going through a period of transition, for some that transition will be too much, for others there may not be a place for them. But for most of us it will bring serious change to the dynamic and thrust of this movement. It will bring it together under one banner, acting at all times as a coherent unit. No more solo runs, no more local autonomy. I ask you all to work with us to make the change happen. For some it will happen to fast, for others not fast enough, but what will certainly happen is change. Comrades, this year we need to develop in areas we are not established. Large areas of the 26 counties don’t know us and what they do know is from what they’ve read about us, most of it negative. We need to develop our international contacts, we need to internationalise our struggle and movement. In areas where we do have a presence we need to increase recruitment. They must be of the right calibre and willing to work. Anyone who wants to be around us but only wants to be seen around us is of no use. Anyone who doesn’t wish to engage in community or Republican projects and anyone who doesn’t wish to politicise themselves are not wanted. Nobody is better than anyone in this movement, nobody is above anything. I have to include a special mention to the Cogús POWs on E2 Portlaoise and Roe 3 Maghaberry. It is with a great sense of pride that I state these lads have withstood criminalisation and brutality, and in Maghaberry, undermine and absorb also. They are a credit to this movement. Their determination to overcome obstacles with odds firmly against them is a shining example to us all. 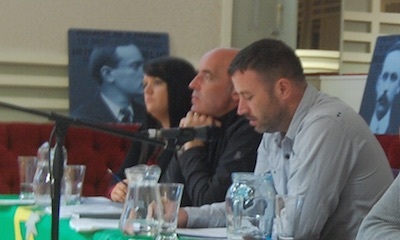 Two weeks ago we lost our friend and comrade Óglach Henry McErlean. Henry was known right across this Island. He was always full of life and fun to be around. At 62 years of age with a number of prison sentences behind him, he could have went home, to coin a phrase, but he never. He stayed on, he wanted to help in any way he could. Many of us feeling sorry for ourselves or looking a carriage clock for retirement should look to Henry for inspiration. Henry showed us all that behind the mask, behind the smile and the banter that we all have our demons and pains. If any one of us needs a friend or help, seek out one of us here, seek out help. Please comrades don’t suffer in silence. Today a new leadership was elected, I believe that they will bolster this party, the young people elected will be lightning rods for the change we hope for. I ask you all to join me in welcoming them into their roles and by giving them your full support in the year ahead. Comrades, I have held you back enough today. We have much to do and little time to do it. To use a recently used phrase ‘it’s time to put up or shut up’ – go home friends and come out tomorrow fighting.